This is our third day “on station” at 85 W. Since successfully retrieving the mooring yesterday most of the scientists on board have been taking apart all the scientific instruments that came up with it. Their hope is that data was recorded all year long and that now they can transfer it to their onboard computers to bring home. Along with that many people are preparing for tomorrow’s deployment of the new buoy. There are many things to consider, such as the length of rope (4400 meters!) and the depth order in which the instruments are to be attached. Each instrument must be placed along the rope so that it hangs precisely at a certain depth. Furthermore, the barnacles that were attached to the instruments that were brought in yesterday really made it difficult to get at the sensors. So today many of us are painting the instruments with a special paint that barnacles and other sea life don’t like. It’s called “anti-foul” paint. It’s used a lot on the bottoms of boats and such and it smells really bad! Hopefully it will make the buoy unattractive to barnacles. The most important thing to consider though is where to put the mooring. X may mark the spot on a map, but it doesn’t work in the ocean. Just like the land around you has hills and mountains and valleys and plains the ocean floor is not smooth. In general the depth of the ocean in this part of the world is 4000 to 5000 meters. But if you needed to sink something to the bottom it would be important to know that it’s not going to land on an underwater mountaintop or be pulled down into a deep valley. The Ron Brown has a type of radar called the “sea beam” that looks straight down to the bottom of the sea and sends out acoustic signals. It measures how quickly those signals bounce off the bottom and return to the ship. This tells the computer how deep it is right there. It keeps doing this so the computer can form a picture of the bottom of the sea. It actually forms a map so the scientists can “see” where to drop the anchor. Shortly after completing our “web cast” while I was still on the bridge, the ensign on duty reported seeing an object in the water. We all took up binoculars and sighted a bright orange rectangular shaped object, about the size of a shoebox, that was floating off the starboard side. The captain quickly called the crew on deck and told them to prepare to retrieve the item as the ship approached. Of coarse everyone crowded around to see it being brought on board and was speculating as to what it might be. Drugs! Money! Perhaps a love letter! Because of its bright orange wrapping it was obviously meant to be discovered. Some speculated that it was just a piece of safety equipment that had fallen off a ship. The first thing we all noticed when it was lifted on to the deck was the barnacles attached to its underside. From this we inferred it had been in the water for several months, but because of the small size of the barnacles, probably less than a year. The captain came down and used a knife to cut it open. Alas, nothing but Styrofoam inside. We felt so let down! In my broadcast today, I said I would give a t-shirt to the first student who could identify the signal flags on the back of the shirt. Look at the photo carefully, and if you think you know the answer, send me an e-mail. Be sure to include your name and teacher’s name so I know how to contact you! Good luck. Question of the day: Is it necessary to paint all the instruments that will hang along the rope with anti-foul. Should the ones hanging at 50 meters get the same amount as those that hang at 500 meters or 1500 meters? Why or why not? Photo descriptions: This is my roommate Claudia and a scientist from Ecuador helping paint the instruments with Anti-Foul Paint. 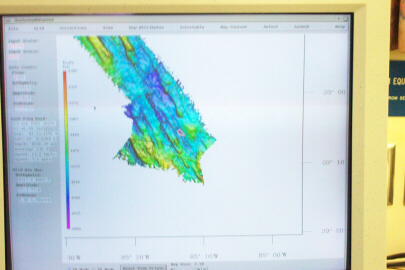 This is a photo of the Sea Beam Radar that is mapping the floor of the ocean underneath the ship. Here are 2 photos of the mystery package that turned out to be nothing! 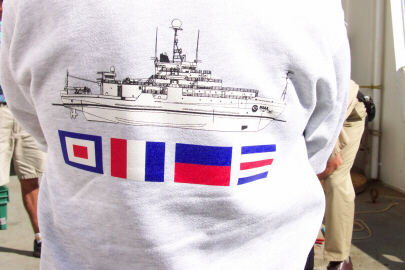 Look carefully at the signal flags on the T-shirt. Do you know what letter each flag signals? 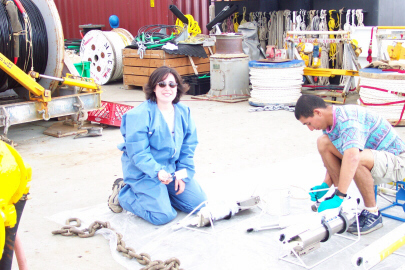 This entry was posted in 1990-2002, Jane Temoshok, NOAA Teacher at Sea and tagged anti-fouling paint, barnacles, EPIC, Mooring, noaa ship ronald h brown, package. Bookmark the permalink.